A note to new readers: while Wordcandy mostly reviews fiction, we do make space for the occasional post on nonfiction books we consider to be of general interest. Previous nonfiction picks have focused on food, money, or (as in this case) the environment. Hopefully you find these featured books as interesting as we do. 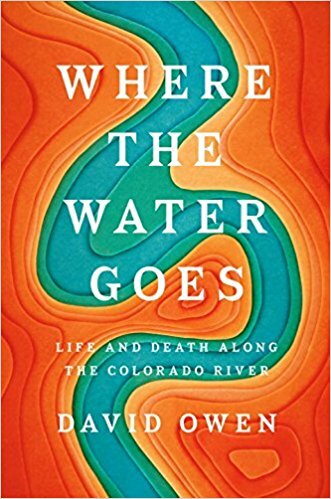 David Owen's Where the Water Goes is an exploration of the Colorado River, an essential water resource for much of the American Southwest. Thanks to a bewildering tangle of legal agreements, every drop of the Colorado has already been claimed by someone, and the water is used (and re-used) so often that the river completely dries up long before reaching its former mouth. Owen organizes his book around a journey from the headwaters of the Colorado to the spot where it finally runs dry, using the geography of each area to dissect the historical, current, and future issues facing the various sections of the river. As with any book about American water systems, the shadow of Marc Reisner’s classic Cadillac Desert looms large over Where The Water Goes. Owen isn't the writer Reisner was (his “human interest” details are frequently pointless—clothing choices, hotel experiences, etc.—and he throws around unnecessary commas like confetti), but there is definitely a place for both books. The more focused approach of Where the Water Goes lacks Reisner's overarching vision, but it allows Owen to explain the difficulties besetting the Colorado with greater nuance. Readers looking for decisive what-we-need-to-do-next answers are likely to be disappointed, but anyone interested in one of the more pressing (and under-reported) problems facing the American Southwest will find this book highly rewarding.